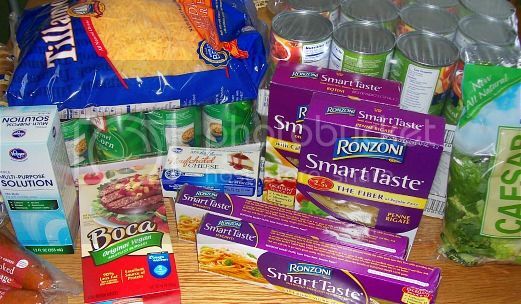 Frugal and Thankful: A few ways to save some money on grocery shopping. A few ways to save some money on grocery shopping. A couple of days ago a friend contacted me asking for some advice on how to lower their spending on groceries. Their family had to go on a bare-bone budget, and she was wondering if I had any tips and tricks up my sleeve. 1. Shop less! This might just be the easiest way to save. The less we go to the store, the less we put in our cart. Seriously! For some people, once a month shopping works the best, others -like me - prefer weekly trips. But if we shop daily, more than likely we will buy many things that we want but not necessarily need. So before you go shopping, take a full inventory of what you have. And yes, it does include the very back of your freezer. Then try to keep track of everything or at least the things you use on a weekly basis (I have this printable pdf freezer inventory list here to get you started). 2. Create a menu. Now that you know what you already have on hand, try to create a menu to use things up. A weekly (or even monthly) menu plan allows you to, again, use up what you have on hand and also to avoid buying duplicates or unnecessary things in a store. It might seem a little intimidating at first but when you know your stock, creating a menu will be a very quick process. And it will save you not just money but also time in the future. When dinner is planned, you can avoid that 5 pm "what to do, what to do" feeling. And remember, your menu doesn't have to be very structured. Be flexible with it to suit your family's needs better. I post our menu plan here every week but to be honest, I tend to mix days all the time depending on what's happening that day. Menu plan should be used as a tool, not a limitation. 3. Make a list, check it twice. And no, I'm not talking about your Christmas wants here:) One of the best ways to avoid overspending at the grocery store is to go with a list of what you actually need. Again, when you follow the two steps above, it's easier to know what ingredients are missing in this week's menu plan. And if you go to the store already knowing what you need, you will not waste countless hours wandering the isles in search of the illusive ingredients for a possible dinner (while grabbing tons of other things that you think you will 'need' along the way). 4. Avoid food waste. Another great way to stretch your budget is to not throw away food. When I create my weekly menu, I leave at least one day to use up leftovers. There are many ways not to waste food, and I shared some of them before in this series of posts here and here. 5. Keep track of what you spend. Save every receipt and scrutinize them at least once a week. When you track your out-of-pocket expenses, you can see how much money you have left for the rest of the month, where your hard earned pennies went and where to cut back. It will also help to create and follow a realistic budget that works for your family. 6. Study store ads. Every week your local stores publish ads to entice you to come shop with them. In order to do that they mark down some merchandise at a loss for them in hopes that you will spend money on other things that are not on sale. One of the best ways to know what is a good deal is to create a price book. I found a great article on how you can do it here. But there might be other ways that would work for you. The bottom line is when you know the best price, you will know when to take advantage of a great sale. Thus said, I don't have a physical price book. After many years of thriftiness and couponing, I just know what price I'm willing to pay for most of the merchandise we use regularly. But for the beginners, it might be the best way. 7. Take advantage of grocery cycles. When I plan our budget every month, I set aside a certain amount for stocking up. Almost everything in the store follows a six week cycle. It means that if something goes on sale, more then likely it will be discounted once more within 6 weeks or so. Again, when you have a price book, it helps to see those cycles. But there are also seasonal savings you can take advantage of. For example, right now is the best time to stock up on baking supplies or pick up an extra turkey or ham for your freezer. Likewise, in summer is the perfect time to enjoy and preserve fresh produce for the upcoming months. 9. Big or small - just watch your wallet! You often hear that buying in bulk saves you money. And it's true in most cases. For example, if you buy a big container of yogurt, you save almost twice comparing with buying it in portion cups. Same applies to the prices of flour, sugar, rice and other staples. But when you have a coupon and an item is on sale, choosing a smaller box might save you more per ounce. Be sure to watch your prices. And don't be brand loyal unless the price per unit on sale is better than the store brand's. 10. Shop in season and locally. I mentioned above that different merchandise goes on sale at different times. Take advantage of those seasonal prices and stock up. Also be sure to incorporate those seasonal items into your menu. Shopping local is another great way to save. It especially applies if you try to eat healthy and organic. Local farmers will often give you the best price, especially if you buy in bigger amounts (that you can preserve later). Farmers markets can also be a great way to get a nice price, especially if you go there at the end of the day. Over the years I found a few locals that I buy produce from on a regular basis on classifieds (for example, cucumbers for pickling). In our classifieds I regularly see items like, for example, eggs from cage-free chickens for 1/3 or so less than what grocery stores asks ($2-2.50 as opposed to $4 or more in a store). And if nothing else, you also help your local economy, and that's always a plus too. 11. Look for food in unexpected places. You can buy food in other places, not just in groceries stores. Drug stores or Big Lots immediately come to mind. But be sure to buy only what goes on sale, otherwise more than likely it will be overpriced. Recent example of a good deal? Just a month ago a 6 oz.package of butterball turkey bacon went on sale in Walgreens for $1. I had a coupon for $1, so I took it home for free. And also in drug stores you can find some amazing steals on non-food items like toilet paper, tooth paste and other personal hygiene items when they go on sale (often combined with a coupon but it's not always the case). I also like to go to bakery outlets and stores that sell merchandise close to the expiration date. You can score some great deals there for items you need to use up soon. 12. Stretch. Another great way to save on groceries is to stretch what you already have. Adding less meat to a casserole will not be noticeable to most members of your family but will provide just as much flavor. Or use that inexpensive piece of meat that you scored on markdown in multiple meals - make a main dish, add leftovers to the soup and make extra broth from a bone. You can also stretch your budget by using frozen fruit and veggies in cooking. They are usually picked flash-frozen at the peak of freshness and cost much less than regular produce. Another thing that I like to do is diluting milk. If you like to drink 1% or 2%, buy whole milk and dilute it in a cup to your liking. It's a great way to stretch that gallon much longer. 13. Substitute. You can substitute many items on your menu for other things you already have in stock. For example, ground turkey or chicken makes a great swap for ground beef in many recipes, its healthier for you and actually costs less per pound (where we live, the regular price of 16oz. ground turkey is about $2.20 but I stock up when it goes on sale for $1.69-1.79. The cheapest 20/80 ground beef that I've seen recently was $2.69). Substitution is a big topic and I think I will leave it for another post. But I believe there are many ways to lower your budget and still have a balanced and nutritious diet. I never take my debit card with me. I figure out what I have to spend and that is what I have. I do allow a little extra if I run into a good mark down or sale but the debit card just gives me to much extra wiggle room. I have no brand loyalty except Hellmans, peter pan pb and dawn dish detergent. Great tips! I am working on getting better with my grocery spending. I tried coupons but it just wasn't worth the time I was putting into it and we have a serious lack of grocery stores with great sales, so it's way easier to shop at Aldi. Also, I never thought of diluting milk! We get 2% for the toddlers in the house and it never occurred to me that I could dilute a glass to taste just like Skim. Thanks for all the fantastic Tips - pinning so I can refer to them again in the future! I'm so envious to all of you, people, with Aldi there :) I constantly hear about their great prices. And I'm glad you found some ideas here useful! I used to use coupons, but found that it took up a lot of my time and wasn't worth the savings. We don't eat to much of the processed stuff (at times we do, but not on a regular basis). I shop at Aldi, It saves me time, cash, and seems to work for my family. Once in a while I go to CVS when they have shampoo (either VO5 or Suave) on sale. This is an awesome list. I don't want to copy it, but could I just make a generic list and link to it? Lots of good tips. I'm sure you helped your friend a lot. Great tips, Lena! :) I find shopping with cash helps & stocking up on dirt cheap sale items! The pasta & sauce we buy here is usually $2.50'ish a pkg here (for the "cheaper" stuff) so when it goes on for $1.00 a pkg/can, I try to buy about 8 of each! We use it a lot and save a lot of $$. I do this too! I'm blessed to have a nice size pantry for stocking up. I usually make a list once a month of everything I have in the pantry, fridge, and freezer. I try and mark the items that have been lurking around to attempt to use those first. I found that it keeps me on track and uses up a few things before I go to the store again.In really hard times, this would work out to make a list, and if there was not any money for shopping, make a menu with what was been written down, and make as many meals and you can. I would do this in harder times, and when we have a month or two in a row that seems to be finally harder than the previous. It does work and keeps everyone fed. Try and put off grocery shopping as long as possible, unless the family revolts, and sit them all down and explain it to them. I've did this and it seems to help keep everyone on the same page. I need to make a shopping list and menu for our Christmas shopping or I know I'll go way over budget and I do not want to do that! Before I go to the grocery store, I make a list and come up with an estimated amount that I will spend by browsing prices at a local online grocery delivery service. Then my mind is primed with a an amount I am going to spend on each item. I'll be more reluctant to spend more on an item than what I have written on the list. I'll pay in cash because when you have the money sitting in your purse, you'll be more reluctant to part with it. It's very effective in controlling grocery costs but it takes extra effort and willpower.